Always keep an open mind and try to go against the common opinion every once in a while is good practice. Hello everyone! Here I am to introduce you to my newly aquired teapot from @tealifehk. This is my first yixing pot and I'm getting used to brew with it at the moment. I'm planning to use it only with aged and a bit wet sheng. In the following days I'm going to continue benchmarking it and trying everything in my pumi with it. So far the results have been amazing, love having the advantage of heat retention and the muting was just right to fade away a bit of the astringency of them while thickening the liquor a bit. i'm in love with the balance. shuiping geometry is legendary for a reason. That's a gorgeous image, and a very nice pot. I can't afford to pay the closest attention to this topic, so I missed it when it was first posted. Just managed to clean those after returning from the holidays and going to start prepping and see how they perform. Both are so called Julunzhu, as far as I know and others counseled, from the ROC period, so fully handmade and from the dragon kiln's wood-fire. I have been admiring the simple beauty of the Julunzhu shape, the duanni one has it, since I saw it on MarshalN's blog a looooong time ago. Never would have dared to dream to own one back then! Now luck has brought me two! The Zini is a less common version of JLZ, but actually more pretty! Both have quite good workmanship for this kind of teaware, usually they can be rather crude. This old Zini clay is completely different in tonality to later ones. A rich chocolate brown. Before cleaning the pot had a deep brown shine and patina, which is now reset. The other Zini from the 80s I have, are a lot darker. My first Zini, that I purchased and more importantly, in a shape that I really love! I never owned a Duanni, so that is a cross on the bucket list! Seems less yellowish, slightly greyish. Here's to an even more successful 2019! @Teachronicles I guess you could almost say gifted, the price I got them for was a fraction of the market price (Asia)! I still can’t believe I got two! Just got this 120ml beauty. Looks to be early 70’s Hong ni. It should be an interesting comparison to the late 70’s 120ml that I’ve been using daily for the past 2.5mo. Back right, and right, respectively for first and second picture, is the pot in the first link/post. The front pot I posted earlier in the thread. I'm posting this pot now because I'm having some yancha in a gaiwan, that I usually have in that pot. The difference is remarkable, the tea in gaiwan has a rougher mouthfeel, and is less rich than in the pot. I hadn't done extensive tests with that pot, so it's good to know I made the right choice dedicating it to yancha. 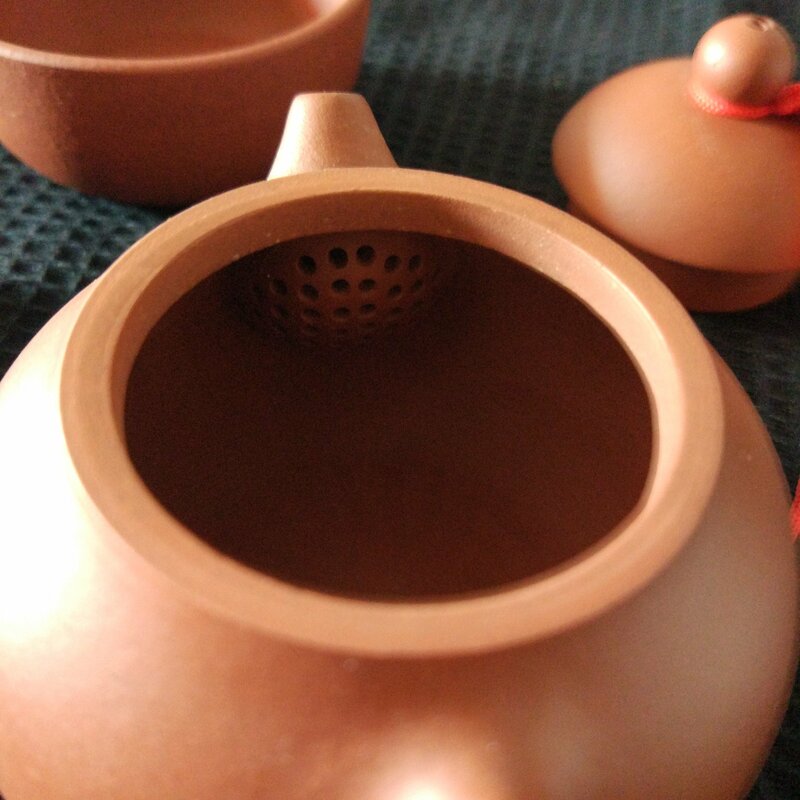 With some authentic TW tea in my possession, I took the opportunity to explore the craze of matching Da Hong Pao clay with Taiwanese that peaked during the 80s and 90s. Without a doubt, a good DHP pot truly brings out the best in the roasted DongDing. Sweet, Aromatic, Smooth and lasting HuiGan. Can also see the DHP teapot glow from within. Will report further as I keep on testing the pot with different TW teas. Really such a beautiful pot. Very nice proportions and qing! I hope to get an ROC or Qing pot one day, that's the last on my list of yixing pots to acquire. That pot comes pretty close to my ideal pot shape, the proportions are just perfect and the clay is something to behold in real life!